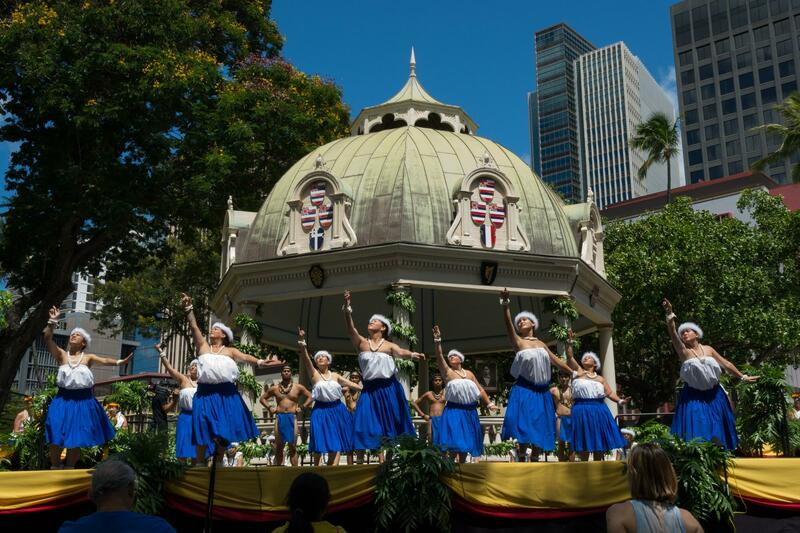 Halau o Kekuhi from the Prince Lot Hula Festival 2017 at iolani Palace. 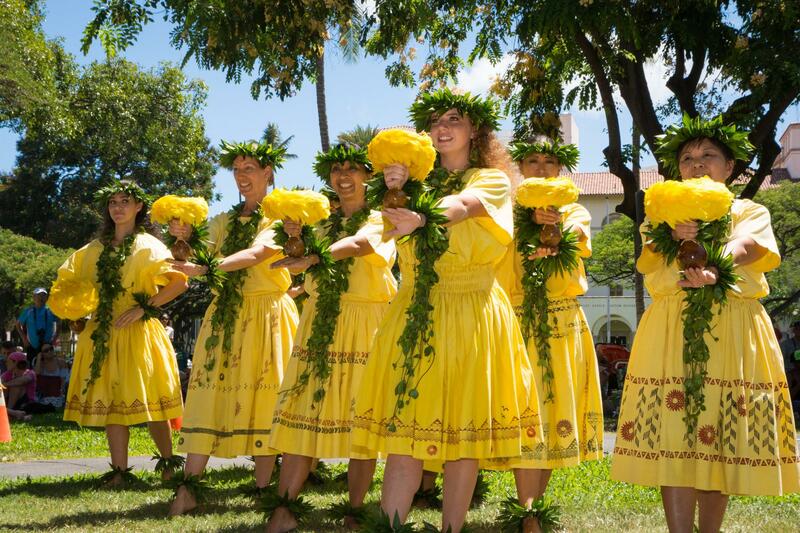 This halau will open festivities for 2018, as sisters Pualani Kanaole Kanahele and Nalani Kanakaole are honored with the Malia Kau Award for their contributions to hula and Hawaiian culture. Dr. Kalena Silva has been called one of the greatest chanters of his generation. He is Director of Ka Haka Ula O Keelikolani, the College of Hawaiian Language at the University of Hawaii at Hilo. 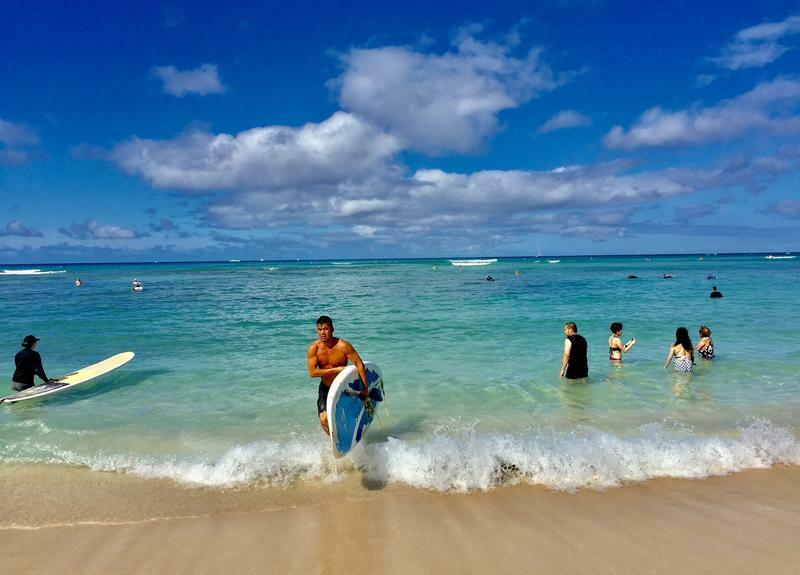 A brief look at Hawaiian chant with Dr. Kalena Silva. Mahalo to Dr. Silva for these sound files. 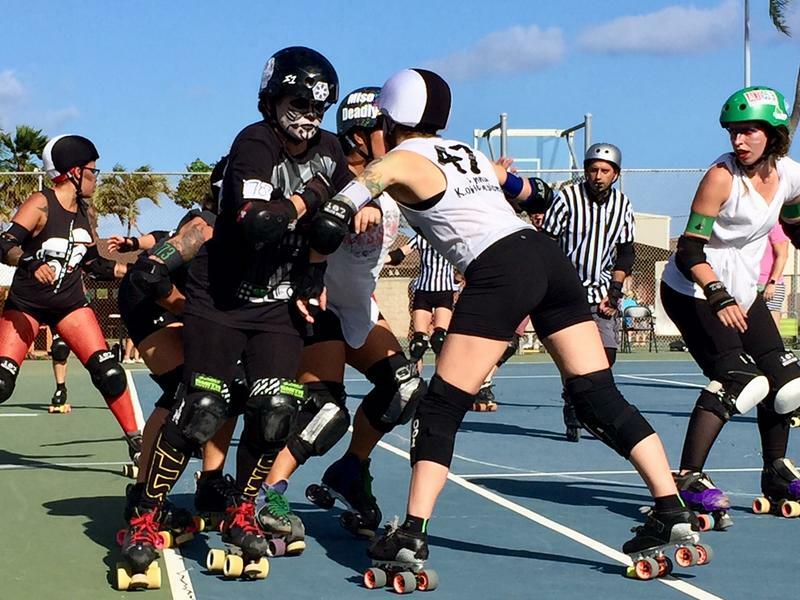 (Apologies, this program does not accommodate Hawaiian punctuation in captions.) 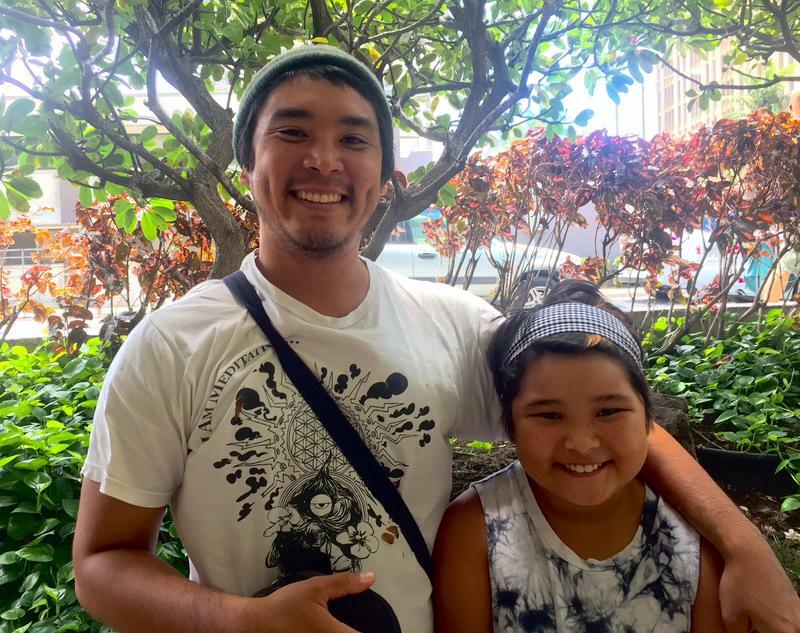 The first, is Namakahelu Makaena, the master chanter of Moanalua, chanting a hoaeae, a poetic genre about the longing for a loved one--in this case, a child who has left home. The next two files by Dr. Silva honor Queen Emma and her connections to Maunakea. 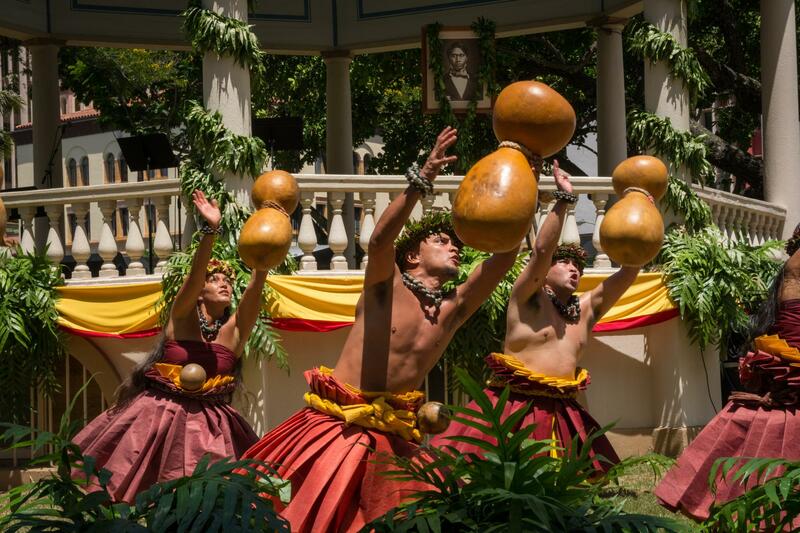 The mele accompanied by gourd, or ipu, is a hula olapa style influenced by Christian hymns. The other is in the olioli ii style from pre-Cook times. 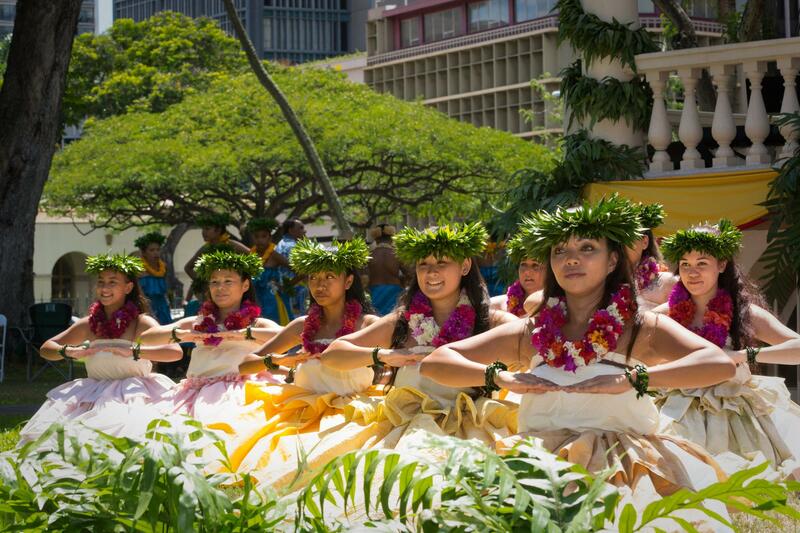 A longer conversation with Dr. Kalena Silva about the art of Hawaiian chant. 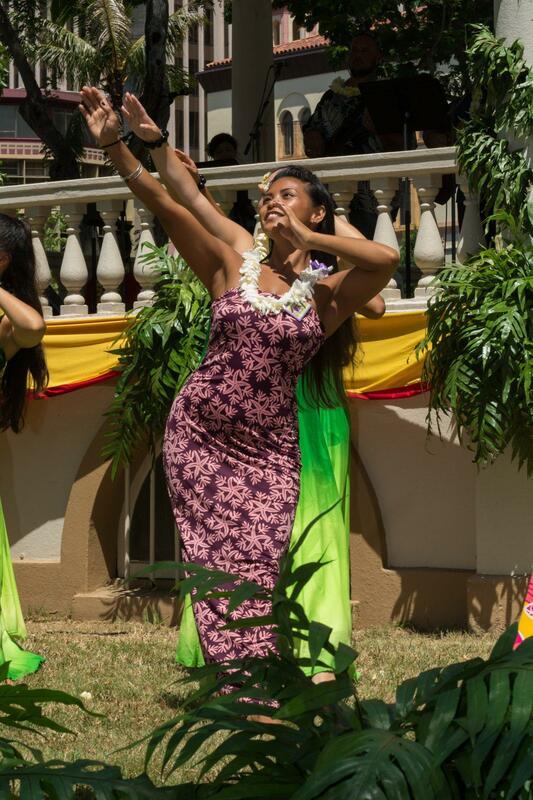 Halau Hula o Namakahulali at the 2017 Prince Lot Hula Fest. 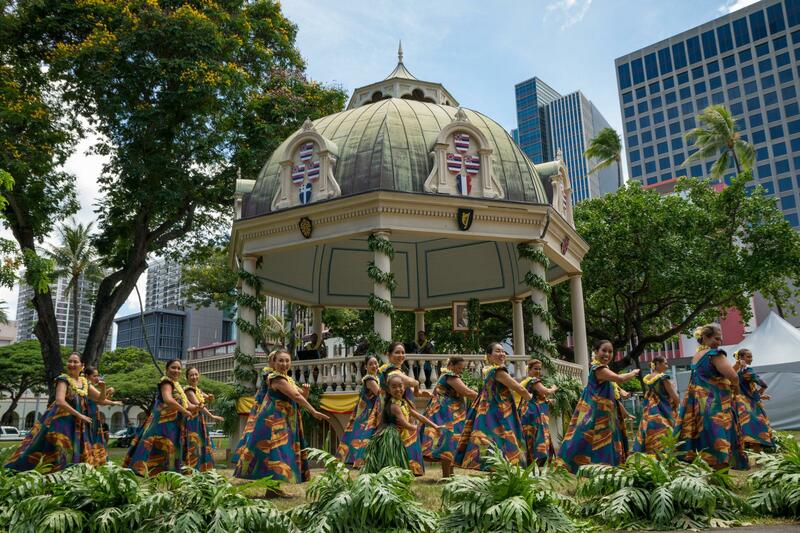 The 41st Annual Prince Lot Hula Festival runs this Saturday and Sunday, July 21 and 22, 2018, at ‘Iolani Palace, with crafters, cultural practitioners, and local food available across the Palace lawn. Bring mats and beach chairs. There’s free admission to ‘Iolani Palace on both days. Dr. Kalena Silva has been called one of the greatest chanters of his generation. 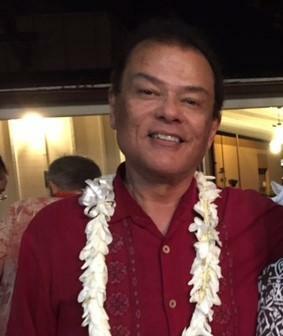 He is a scholar and Director of Ka Haka 'Ula O Ke'elikolani, the College of Hawaiian Language at the University of Hawai'i at Hilo is the Director, College of Hawaiian Language of University of Hawaii. He is a master chanter, a kumu hula, a musician and a scholar of Hawaiian language, history, and culture. Dr. Silva says Hawaiian chant is very different from western singing. Silva: It’s a higher sound, it’s more in the head, not so much in the chest. Ka Hale I O Kahala Halau at the Prince Lot Festival 2017. Silva: Ni‘ihau people when they sing hymns, have retained a lot of this nasality in the way they sing. If you listen to some of the falsetto singers today, they’ve retained some of that nasality. That comes from chanting. There seems to be a sort of buzzing quality about the chanting sound. Silva: I’m so glad you heard that! We have a word for that in Hawaiian, it’s kind of a humming sound or a buzzing sound, we call it “hano.” If a chanter is producing the sound correctly, and I hope I was, you can hear what we call “hano,” that kind of humming sound behind the vocal sound itself. This Sunday, the Moanalua Gardens Foundation will present Dr. Silva with the Namakahelu Oli Award, named after Namakahelu Kapahikauaokamehameha, the last chantress of Moanalua. She was recorded in the late 30’s, and early 40’s. Hear her voice and the voice of Dr. Silva in the recording above. Silva: Exceptionally beautiful. She had a deep voice, Namakahelu did, very resonant voice. Effortless. When she chanted it sounded like a bird flying over the ocean effortlessly. Exquisite. She’s one of my favorite chanters that’s why I was just delighted when I got the call I did say to them, the Foundation, that I really can’t accept this until my own teacher, Ka’upena Wong, who is living in Mākaha still, he’s almost 90 now, until he is honored. Hlau Hula O Hokulani at Prince Lot 2017. Master chanter Ka’upena Wong was Silva’s teacher, and the first recipient of the Namakahelu Oli Award. Hear his voice in the NEA National Heritage Fellowship recording. Listen here to Master chanter Ka’upena Wong, the first Namakahelu Oli Award winner doing a heartrending Moloka‘i chant. There were also spontaneous exchanges of chanting, that might be affectionate, admiring, or even taunting. Halau Kealakapawa at Prince Lot 2017. Silva: Although spoken Hawaiian is heard more and more today, that ability to improvise, spontaneously compose in Hawaiian is another step up. That’s why I have so much aloha for the kūpuna who have passed, the kind of mental dexterity as well as vocal dexterity that the old people had. What that requires of us, some generations hence, it requires us to rekindle the interest, and to make the effort to retrieve it, but with the understanding, which is very important, that it’s not going to be exactly the way it was then. It cannot be. Silva: Things that are living have to evolve. Those of us in Hilo who want to see Hawaiian flourish, we also want our Hawaiian speakers to be very a much a part of our global society, citizens of this world! The chanting is not going to be the same because our world is different, so what we bring back is going to be in response to what works now. 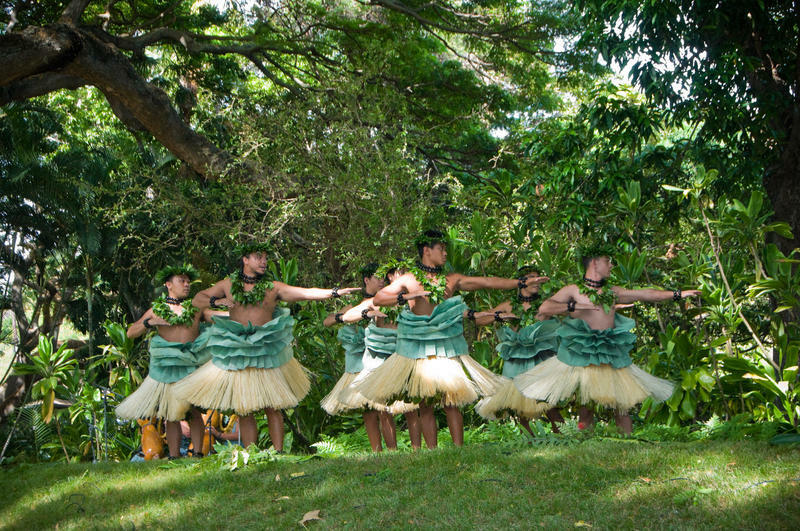 Na Pualei O Likolehua at the 2017 Prince Lot Hula Festival. Dr. Silva says he has great hopes for the generation of speakers and chanters now in their 20’s. He will receive the second Namakahelu Oli Award this Sunday at the Prince Lot Hula Festival, honoring his ability, his scholarship, and his contributions to the art of Hawaiian chant. On Saturday, sisters Pualani Kanaka’ole Kanahele and Nalani Kanaka’ole of the award-winning Halau o Kekuhi will receive the Malia Kau Award, for their enormous contributions to hula and Hawaiian culture. If you're interested in Hawaiian chant, don't miss this paper on the topic written by Dr. Silva.